I was puzzled when a friend asked me a few weeks ago if I’d seen the “rocket cat” illustrated in a Penn manuscript which had been featured on the book blog BibliOdyssey in November. The image, from what was described as a 1584 “Feuer Buech” manuscript, appeared to show a cat and a bird propelled by rockets towards a castle. UPenn Ms. Codex 109, f137r. I enthusiastically retweeted the image and began trying to figure out just what was going on in the manuscript . Since then, the “rocket cat” has gone somewhat viral, appearing in the Atlantic, BoingBoing, and elsewhere. Given the illustration’s new-found fame I thought it would be worthwhile to provide a bit of context. In this case, a c.1590 “Book of instruction for a cannon master.” Clearly these fiery animals were more than just the fancy of one manuscript illustrator. Further, the text accompanying the illustration in both Codex 109 and LJS 442 did not match anything I could trace in editions of the Feuerwerkbuch. 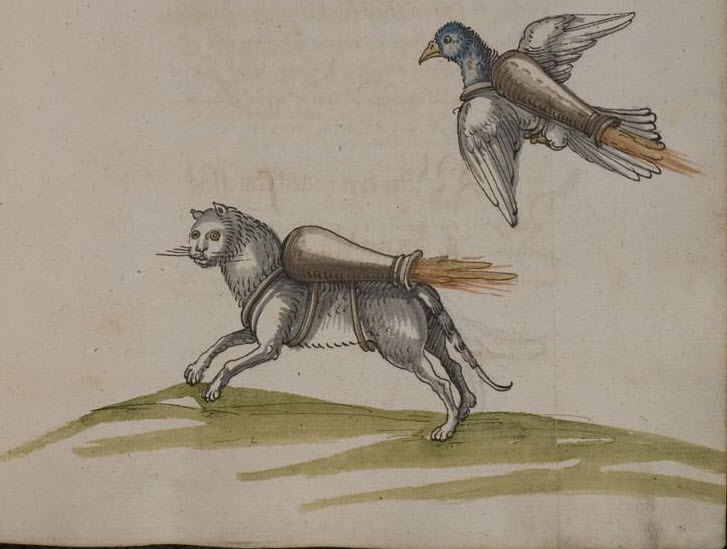 Fortunately, in the torrent of tweets about the rocket cat, one came in citing yet another example of the illustration, this time from a manuscript at the Universitätsbibliothek Heidelberg. Heidelberg has cataloged their manuscript as the “Buch von den probierten Künsten” of Franz Helm. Though drawing on the Feuerwerkbuch, this text dates from a century later (c. 1530) and includes large new sections on siege warfare and different types of explosive weapons. In fact, the Penn collection includes an identified copy of Helm’s treatise, though unillustrated (LJS 254). Thanks to a recent critical edition of the work I was able to confirm that the text of both LJS 442 and Codex 109 were indeed from the Buch von den probierten Künsten . There’s no way to know if Helm himself ever employed this method of pyrotechnic warfare but strangely enough the idea of using cats and birds in just this way appears in historical texts from many disparate regions of the world. In a magisterial article on the subject, the Finnish scholar Pentti Aalto cites examples of incendiary-bearing cats and birds from a 3rd c. BCE Sanskrit text, the Russian Primary Chronicle, early Scandinavian sources, and an early modern history of Genghis Khan . 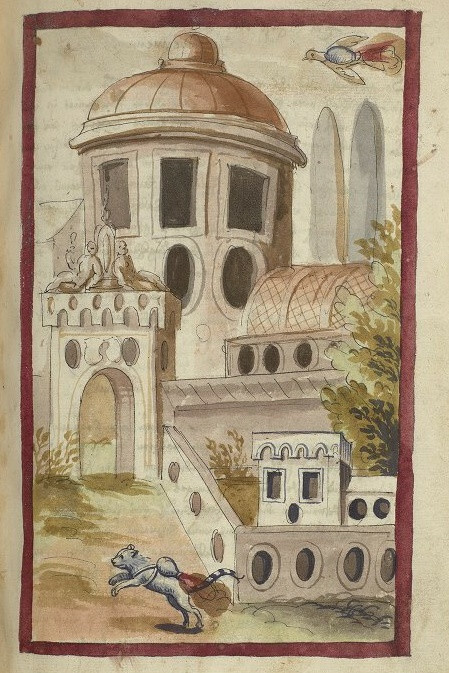 Though not actually depicting ‘rockets’ of any kind, these images help demonstrate the enormous demand for manuals on gunnery and explosives in the early modern period as well as the robust world of 16th c. manuscript copying and the persistence of illustrations and manuscript forms into print. 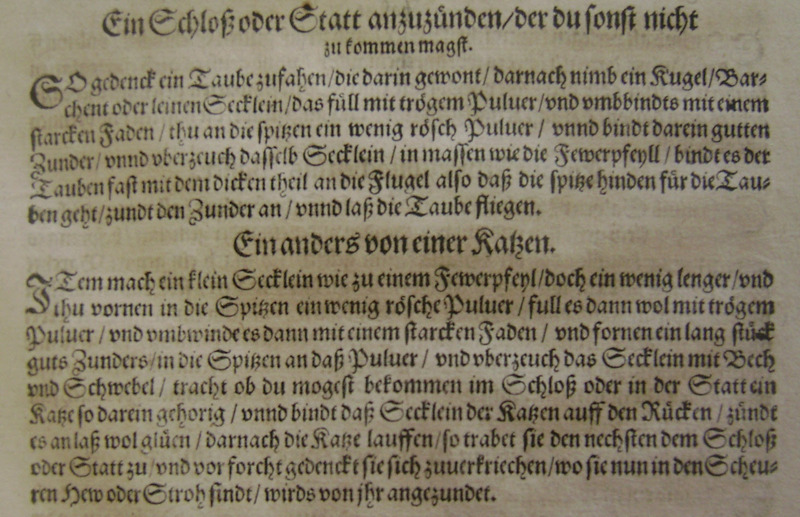 For a facsimile of the first printed edition of the Feuerwerkbuch (Augsburg, 1529) along with a transcription in modern German see Hassenstein, Das Feuerwerkbuch von 1420, (Munich, 1941). For an English translation of the manuscript text of the Feuerwerkbuch with notes see Gerald W. Kramer and Klaus Leibnitz, “The Firework Book: Gunpowder in Medieval Germany,” The Journal of the Arms & Armour Society 17.1 (March 2001), p. 1-88. Rainer Lang, Franz Helm und sein “Buch von den probierten Künsten (Wiesbaden, 2001). “Olga requested three pigeons and three sparrows from each household. Upon their receipt, her men attached rags dipped in sulphur to the feet of each bird. When the birds returned to their nests, they lit the city on fire and the Derevlians perished in their homes.Olga’s vengeance was now complete.” The Russian Primary chronicle : Laurentian text, (Mediaeval Academy of America,1953), p.81. Mitch Fraas is a curator at the Kislak Center for Special Collections, Rare Books and Manuscripts at the University of Pennsylvania Libraries. It’s Samson all over again. Except, you know, with cats and birds and stuff. I learned about this from the book Greek Fire, Poison Arrows, and Scorpion Bombs by Adrienne Meyer. Interesting stuff! Not actually relevant to GIS, but amusing nonetheless! Funny how ideas can keep cropping up! 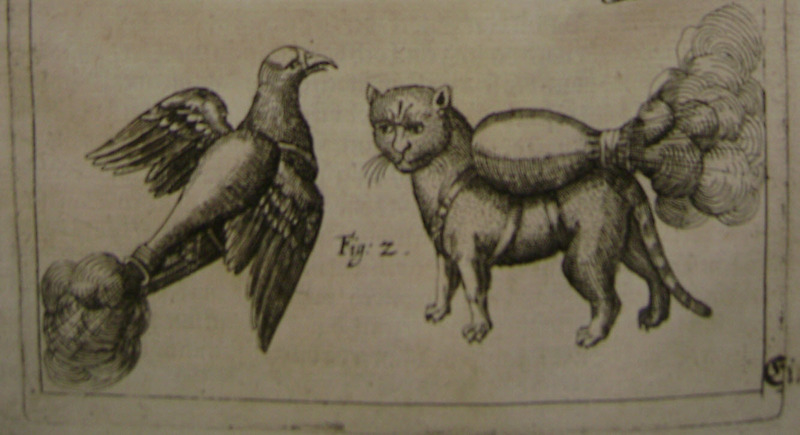 Thought you’d be interested in our “rocket” cat and bird at the Folger Shakespeare Library: http://luna.folger.edu/luna/servlet/s/t876v2. We clearly need to get to work on improving our catalog record! Thank you! Thanks Heather – that’s the most elegant one yet! I don’t endorse the militarization of cats but I note that said cats don’t seem to upset with the circumstances. Perhaps this records a brief and terrifying moment of military ascendancy amongst European felines in the late 16th century, now largely lost to history. We discovered a 1536-1538 version of this manuscript in our collection as well. The drawing is not quite as elegant, though, but the text is similar. We made a post about it on our Facebook-page, and naturally we also pointed to this blog, where we got the information first. Possibly the most influential psychologist of the 20th Century had a very similar idea, codenamed ‘Project Pigeon’. Many thanks to all those who have commented or contributed. Special thanks to Stephen Haw who pointed me to an 11th c. Chinese manual with fire birds and oxen. Also H. Stiles who cites the 11th c. Saga of Harald Hardrade and the use of fire birds in Sicily. Back from an hour of reading the preview on this engaging military history of the Mongol’s and associated tribes. Here’s some measure of a source for Genghis Khan’s use of the strategy.